Rheinmetall's Lynx IFV hopes to provide a price point that captures the imagination of the export market. Its first potential customer could be Australia. German arms manufacturer Rheinmetall used the international defence exhibition Eurosatory 2016 in Paris to unveil the demonstrator for its new Lynx Infantry Fighting Vehicle (IFV). 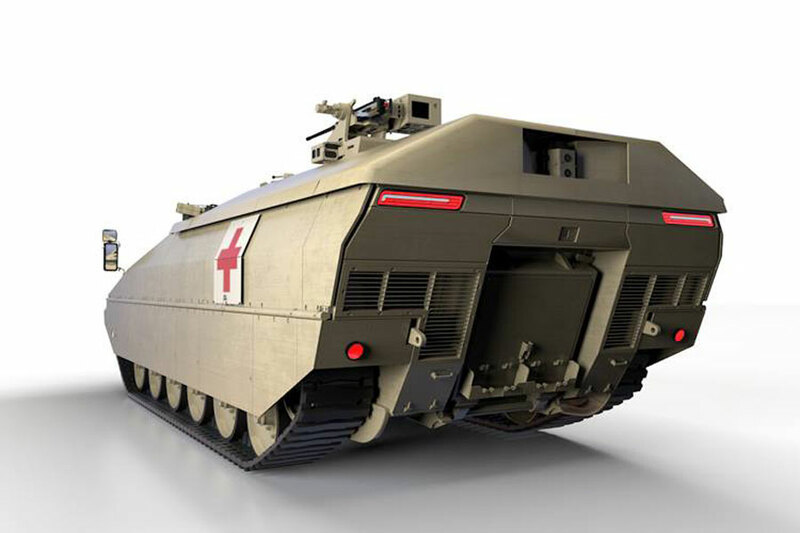 The vehicle forms the basis of a modular family of tracked armored vehicles (Kettenfahrzeuge – KF) which includes besides the Lynx (the KF31), the larger KF41 Lynx IFV as well as a reconnaissance, command and control, repair and recovery vehicle, an ambulance variant and an armoured personnel carrier. According to Rheinmetall, the Lynx family of tracked armoured vehicles is at the forefront of a new trend in IFV design towards armoured vehicles with lower unit and through-life costs and reduced complexity. One of the key principles of the Lynx concept is the integration of proven sub-systems with a high technology readiness level to reduce development time, cost and technical risk. The features at the heart of the Lynx design concept include the separation and modularity of the vehicle into two primary parts: the basic vehicle and specialist mission and role equipment. Specific variants will be built around a common hull, common mobility assemblies and protection components, to which role and mission-specific equipment will be added on an as required basis. The mission kit consists of a specific roof, specialised installations and equipment. This design approach combines the functional, cost and through life advantages of a modular structure, and the weight, space and cost advantages of an integral hull design. The Lynx family of tracked vehicles is designed to conduct all possible kinds of military operations ranging from peace support operations to conventional high intensity combined arms operations. During the Lynx's development, which commenced in 2015, the focus was placed on the core capabilities of mobility, protection and firepower as well as situational awareness. Where possible proven technologies and components were used to minimise the costs and reduce the development time. Therefore, it’s not surprising that the KF31's hull is very similar to the Marder 1 Armoured IFV hull. The KF31 with a length of 7,220 mm, a width of 3,600 mm and a height of 3,300 mm has a gross vehicle weight of 38 tonnes. It provides sufficient space for a three-man crew consisting of the commander, gunner and driver, as well as up to six dismounts in the rear crew compartment. In contrast the longer KF41 Lynx has a gross vehicle weight of 44 tonnes and a length of 7,730 mm and can transport a three-man crew and up to eight dismounts. The requirement for eight dismounts cannot be met by current, high-cost IFV designs. The crew compartment is designed as a mission neutral space with the incorporation of C-rails and a pattern of universal fixing points on the walls and floor resulting in a flexible configuration for all mission specific equipment. The dismounts can enter and leave the vehicle via a large power operated rear ramp. The KF31 and the Lynx family of tracked armoured vehicles mainly focus on the export market and the needs of potential foreign customers for which the procurement of the Puma AIFV is not an option due to financial constraints or because the vehicle doesn’t fulfill their requirements. The first potential customer for the Lynx family of tracked armoured vehicles could be Australia as their defence forces plan to replace their aging M113 Armoured Personnel Carriers and procure 450 AIFVs and Combat Support Vehicles as part of their project Land 400 Phase 3. 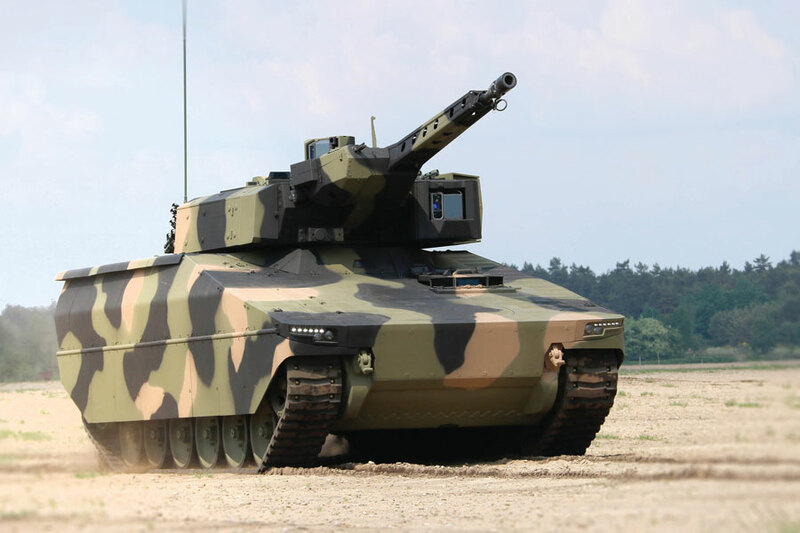 Recently, Rheinmetall's Boxer and BAE Systems' Patria AMV35 8x8 were announced as the two shortlisted vehicle bidders for the Combat Reconnaissance Vehicle segment of Australia's multi-billion dollar Land 400 Phase 2 project . 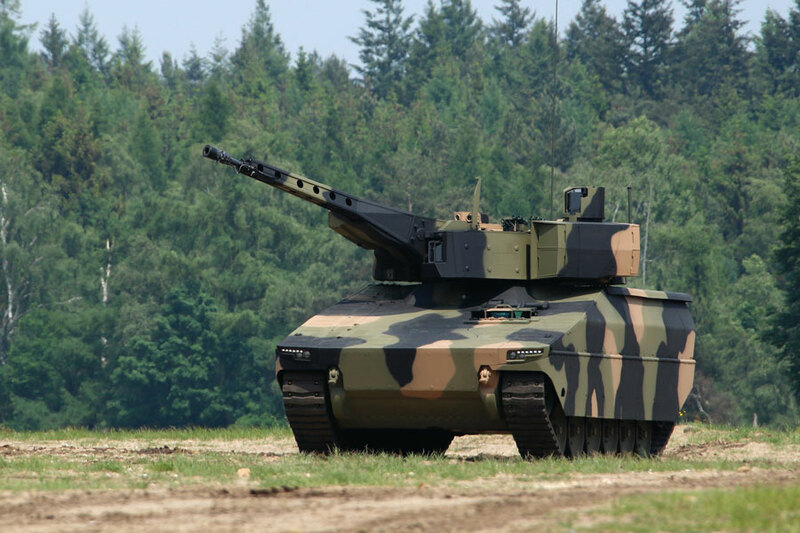 Rheinmetall believes there is a real opportunity to look at the combination of Land 400 Phase 2 and 3 together and deliver an Australian industrial capability solution without peer. The KF31 is powered by a 563 kW diesel engine mounted in the front of the hull providing a maximum speed of 65 km/h. Based on current plans the KF41 will be powered by a 700 kW diesel engine and should even reach a maximum speed of 70 km/h. The engine cooling system consists of two coolers on the left and right rear sponson providing the lowest possible infra-red signature, optimal ballistic protection and a well-balanced centre of gravity. The final drives with the sprockets are mounted in the front and the idler wheels with track tensioners installed at the rear of the hull. The running gear features six road wheel stations per side guiding a rubber band track or lightweight end connector track based on the customers’ requirements. The road wheels are mounted on a proven suspension system consisting of swing arms with conventional torsion bars and damper systems. This concept is both reliable and cost-efficient. The Lynx vehicles will be able to cope with 60% gradients and up to 30% side slopes. Trenches up to a width of 250 cm, obstacles up to a height of 100 cm and waters up to a depth of 150 cm are no match for the vehicles. The vehicle's ballistic armour is designed to protect the Lynx fro anti-tank weapons, medium-calibre ammunition, artillery shrapnel and bomblets. The basis of the hull is made of welded armour steel plates. In order to increase the protection level, passive or reactive modular armour elements or a bomblet protection can be added. The interior is fitted with a spall liner to protect the crew, while the vehicle also mounts decoupled seats in addition to mine and IED protection packages. The compact heating, cooling and nuclear, biological and chemical filtration system is combined in an environmental control system stowed in the rear-located left sponson in front of the cooling system. Air ducts lead to the floor and to an air duct interface on the top end of the hull. Protection against hand-held anti-armour weapons and anti-tank guided missiles is offered as an option when fitted with Rheinmetall’s 'hard kill' Active Defence System. If necessary, Rheinmetall`s Solar Sigma Shield Mobile Camouflage System can also be attached to the entire vehicle to reduce the heat loading as well as thermal and IR signatures. 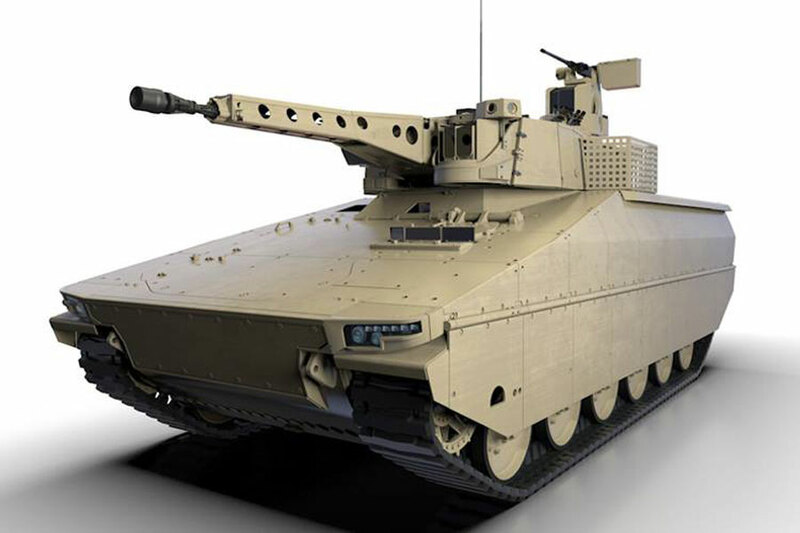 The Lynx features the two-man 360° LANCE medium-calibre turret based on the Modular Turret System developed by Rheinmetall, which is designed with an internal ballistic protection for the crew. There are no weapons or ammunition stowed in this compartment and the main and co-axial weapons are stored in cradles at the front of and external to the compartment. The LANCE turret enables highly accurate and rapid engagement of static and moving targets whilst the vehicle is stationary or on the move. The main armament is a stabilised 30 mm x 173 MK30-2/ABM cannon also used by the Puma AIFV, but it can also be equipped with a 35 mm cannon based on customer requirements. The MK30-2/ABM has a double belt ammunition feeding system. The 30 mm cannon allows the Lynx to engage targets at a range of up to 3,000 metres when static and on the move. The vehicle's main armament has an elevation of between +45˚ and -10˚, and has an average rate of fire of 200 rounds per minute. The co-axial 7.62 mm x 51 machine gun featuring an automatic barrel exchange system with three barrels is mounted to the right of the cannon. The machine gun can fire up to 800 rounds per minute. If required by the customer an Anti-Tank Guided Missile (ATGM) launcher can be mounted on the left side of the turret. The demonstrator vehicle at Eurosatory 2016 was outfitted with a twin-round launcher for the Spike-LR ATGM. This is the same launcher-ATGM combination soon to enter service with the Puma AIFV of the German Army. The Spike-LR missile can remain mounted in the ballistically-protected, vibration isolated launcher. In the case of the Lynx KF3, the commander`s and gunner`s station have common human machine interfaces, with each using a duplex control handle and central multi-function display. Both share a common main operational panel and a display for the common battle management system. The main components of the optronics and fire control system incorporated in the LANCE turret are the Stabilised Electro-Optical Sensor System (SEOSS) panoramic sight for the commander located on top of the turret, the SEOSS sight of the gunner aligned with the main armament located at the front left of the turret, the Laser Warning System, Acoustic Shot Locator System and the Situational Awareness System (SAS). Both Stabilised Electro-Optical Sensor Systems are equipped with a CCD camera, thermal sight and integrated laser rangefinder providing a true hunter-killer capability. The turret crew can also perform killer functions with the addition of a remotely controlled weapon station mounted on top of the turret. This functionality is unique with the LANCE turret when fitted with the optional Main Sensor Slaved Armament (MSSA) working in conjunction with the commander’s independent SEOSS sight and is vital during urban operations allowing the commander to engage targets with the MSSA, while the gunner provides continuous fire support for the dismounts. Other optional remotely controlled weapons like the Electro Optic Systems (EOS) R-400 can also be fitted to the turret. Both the MSSA and the EOS R-400 can be armed with 12.7 mm x 99 M2 QCB heavy machine guns, 7.62 mm x 51 MAG-58 or a 40 mm automatic grenade launcher. The SAS features a day/night vision and automatic target recognition. The advanced optronics provide the crew with the possibility to have unrestricted and class-leading capabilities for automatically detecting, recognising and identifying targets and maintaining observation at night and during the day. The vehicle also features a battle management system as well as tactical communications. Ralph Zwilling is based in Germany and has authored numerous reports and books for military magazines and publishers. Recently, he wrote several books about the Stryker IAVs, Dingo 1 and 2 and the GTK Boxer. In May and June 2004, he was embedded with the famous 1st US Infantry Division “Big Red One” during Operation Iraqi Freedom. In December 2012, he was inducted as a Lieutenant into the Honorary Squadron of the 2nd Stryker Cavalry Regiment for his outstanding contribution to the Dragoons during training exercises and events.